Great post – very amusing and I really like the concept of touchstones. Dave is hilarious. I love his blogs. 🙂 Do you feel like doing a touchstone post for me? Would love to have you guest blog! Oooh yes please, thanks! I’ll send you a message about it. Great blog, David. You had me at Tom Baker. I can certainly relate to the influence of 80s Dr Who, especially via an audio cassette of ‘The Genesis of the Daleks’ I borrowed repeatedly from my local library. Unfortunately Colin Baker/Sylvester McCoy ended my Dr Who era, following my massive crush on Peter Davison. I seem to be alone in appreciating the finer points of Peter’s performance, as far as I can tell. I look forward to watching your baptism by Dalek laser. In the meantime, I plan to enjoy more of your genre-smashing, line-crossing fiction. 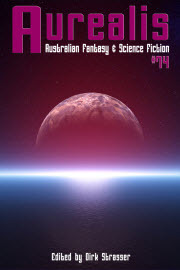 Good luck at the Aurealis Awards! Thanks Georgina! I was hugely lucky that Tom Baker was the Doctor at the exact right moment for me. Although I will say that Sylvester McCoy *almost* surpassed him for me (loved his performance, when he had decent stories to work with, which was…sometimes). As for Davison, I will say I think was among the better actors to play the part. Not many people can deliver a nuanced performance with a camera crash-zooming into a closeup of his face next to a piece of accessorised celery; Davison did it virtually every episode.